One can accuse that nature has been unkind to small nations in the world. It has made the world with a few giants and a large number of dwarfs. Giants are said to be dictating terms to dwarfs making them gullible and vulnerable and finally an easy prey. Yet, a forgotten fact is that nature has given an unusual cunningness to dwarfs to outwit giants. Take for example, the case of the rabbit. It has been programmed to make a zigzag run when it is chased by its arch enemy, the fox. The rationale? To make the game longer, exhaust the pursuer and allow time for the rabbit to find a suitable hiding place. If the rabbit is smart enough, it could avoid being a prey. But if it is not, the fox would be the smarter one. Hence the allegation that nature has been unkind to small nations is not completely accurate. Nature has put both on an equal footing allowing them to deal with each other harmoniously. This has been the subject matter of journalist Malcolm Gladwell’s 2013 book, ‘David and Goliath’. The sub title of the book – ‘Underdogs, Misfits and the Art of Battling Giants’ – tells it all. The central theme of the book is that Davids need not fear Goliaths simply because Goliaths are huge, overpowering and scary. By using inborn cunningness, tact and agility, they can bring Goliaths to their knees. It will enable Davids to prove that they are smarter than Goliaths or at least they both are on par with each other. Gladwell has laboriously documented many instances from recent history where Davids have overpowered Goliaths. Even in the original mythical story of David and Goliath, Gladwell says that Goliath had been created with a defect in eyesight and ability to move fast. Noticing these weaknesses, David is said to have delivered one sling shot on the exposed forehead of Goliath and made him totally disable. Stunned, Goliath falls to the ground. David then runs toward the fallen body, picks up Goliath’s sword and cuts his head off. Thus, a small and inexperienced shepherd boy wins the battle against the most terrible Giant of the day. His secret weapons? Cunningness, tact and agility. The moral underlining this story should not be alien to Sri Lankans. That is because they would have read and devoured, as students in their primary schools, a children’s book authored by Munidasa Kumaratunga, a reputed Sri Lankan writer. That book is ‘Heenseraya’ or ‘The Small Force’. The story in Heenseraya revolves around how a chameleon, a tiny lizard, brought a mammoth elephant to its knees by just creeping up through latter’s trunk and causing him intermittent pain. Hence, dwarfs or Davids are not disadvantaged at all times. The modern day objection for small countries to conduct trade with large countries is based on the fear which Davids harbour in them about Goliaths. Thus, whenever a government plans to sign a trade agreement with a large country, some sections of the population begin to demonstrate their fear of the large country involved in the trade agreement. Their arguments against the big country take the following form. The big country has no genuine feeling of supporting the small country. Instead, it has its own selfish objective to take advantage of the vulnerability of the small country. The small country has no capacity to negotiate on equal terms with the big country. Hence, the trade agreement between the two will always be in favour of the big country. The big country with its large work force will invade the limited labour market in the small country and, in the process, will displace local employees. The big country will also dictate terms to the small country compromising its sovereignty. The worse is that the big country will exploit the natural resources of the small country which will result in total exhaustion of its natural resource endowments. Hence, according to them, any trade agreement with a big country is a bane and should be avoided at all costs. An important fact which those who come up with this line of arguments have ignored is that trade does not take place between countries but between citizens. A country may be big, but its citizens who engage in trade transactions are not as big as the country they belong to. Hence, when a market transaction takes place it happens on an equal footing. For instance, suppose a citizen in a small country like Sri Lanka wants to import a motor car from a big country, say India. The citizen of the small country has the complete freedom to enter into the transaction or not. If the price, terms and the condition of the car are not to his liking, he can at any time withdraw from the transaction. Simply because the car exporter is from a big country does not compel him to go for the transaction. If the argument that a small country cannot do trade with a big country is valid, then, Singapore which has a population of close to six million and a GDP of $ 292 billion cannot do any meaningful trade with USA which has a population of 324 million and a GDP of $ 18 trillion. But since trade takes place between citizens and not between countries, Singapore can without difficulty do trade with USA. Thus, in 2016, Singapore had exported $ 18 billion worth of goods to USA, while it had imported $ 27 billion worth of goods from that country. The volume of trade in the previous years too had been in that region. This observation is valid for any small country like the Maldives that does substantial trade with India or Hong Kong that trades with China. Geographically, Sri Lanka is located to the south of a giant, India. The country cannot do anything about it as long as it is small with a population of just 20 million and a GDP of $ 82 billion. Compared to this, India has a population of 1.2 billion and its annual population growth alone is more than the total population of Sri Lanka. India’s GDP at $ 2.3 trillion is about 28 times larger than that of Sri Lanka. Thus, India is a giant by any account. But being located close to a giant has been in Sri Lanka’s interest. The list of benefits is long, but the more striking ones are that the island has been populated by Indian immigrants, it shares its religious faith, culture and language with greater India and it is to India that Sri Lanka can turn for help when it is in need. For instance, when Sri Lanka’s foreign reserves had dipped to rock bottom levels in 2008 and the country did not have any reserve to pay for essential imports including weapons for the ongoing war, it sought a Standby Facility with IMF. There was an orchestrated lobbying with IMF by diaspora linked to LTTE not to give this facility to Sri Lanka. IMF’s higher ups were sitting on the facility without making a decision. But, a message sent by India’s Finance Minister that if IMF would fail, India would come to Sri Lanka’s rescue did the trick. Hence, India is a giant but at the same time, a friend of Sri Lanka. There are two giants now emerging in the region, India and China. India is a regional giant but China is now growing as a global giant. Sri Lanka has announced that it wishes to enter into bilateral trade agreements with these two giants for enhancing its future growth prospects. Those who are opposed to it quickly point out that the motive of India and China is not sincere and guided by their own self-interest and not the interest of Sri Lanka. Hence, they argue that such a marriage cannot result in benefits to Sri Lanka but an opportunity for exploiting this tiny nation. But what they forget is that Sri Lanka is also acting in its self-interest with a selfish motive behind it. Then, what is to be decided is whether two selfish people can enter into a mutually-beneficial agreement without harming each other. The answer to this question was given by Adam Smith in 1776 when he wrote his famous treatise, ‘The Wealth of Nations’. Prior to Smith’s time in the 16th to 18th centuries, Britain had been inundated by such sentiments that Man’s selfish nature cannot lead to benefits in Society at large. It had been argued that selfishness would lead to one man devouring another. Hence, what was advocated was benevolence on the part of mankind. It would remove selfishness from human action and pave way for the mankind to do good for each other. He said that even a beggar cannot uplift his living by addressing to the charity of others. He could certainly maintain himself, but not an improvement in life. Thus, benevolence of the giants will cause the dwarfs to remain beggars forever. But acting with selfish motive will help both to improve. Trade benefitting both parties involved has always taken place with selfish motive. It is due to the need for satisfying self-interest that people do what they do for their betterment. According to Chullasetti Jathaka, the Buddha had been born as a poor boy in one his many previous births. However, this poor boy became a billionaire by first selling a dead rat for money and then, working tirelessly in his self-interest. In the Old Testament, Joseph who had prior information on an oncoming famine, stockpiled food and sold them to people of Egypt first for money, then, for their livestock, land and finally taking them as slaves. Chulawansa, the second part of Great Chronicle, Mahavansa, says that King Parakramabahu, I, invaded Burma in the 12th century to protect his trade rights. The King of Burma had increased the import duty on elephants from 30 silver coins to 1,000 or 2,000 silver coins, making them no more competitive. The Oxford University academic Peter Frankopan, in his 2016 book, ‘The Silk Roads,’ has documented how countries became rich throughout history through trade done with a selfish motive. Hence, the alleged selfish behaviour of both China and India is not unusual. It will be beneficial to both parties. Sri Lanka’s economy is not in the best shape right now. The economy began to slow down as from 2013 and exports could not grow at the same rate as economic growth from much earlier. As a result, exports as a percentage of the country’s GDP began to dwindle as from 2005. The constriction in exports was mainly due to the economic model which Sri Lanka had adopted from around that time. According to this model, Sri Lanka sought to attain a high economic growth by producing mainly for the local economy – known as the domestic economy-based economic growth. This writer, in a number of previous articles in this series, warned the then Government of the folly of this economic model to no avail (available at: http://www.ft.lk/article/92887/Domesticating-economic-growth and http://www.ft.lk/article/68848/The-rise-of-economic-nationalism). Foreign reserves began to fall as a result. They were built only by borrowing abroad but that strategy resulted in driving the country to an external debt crisis. 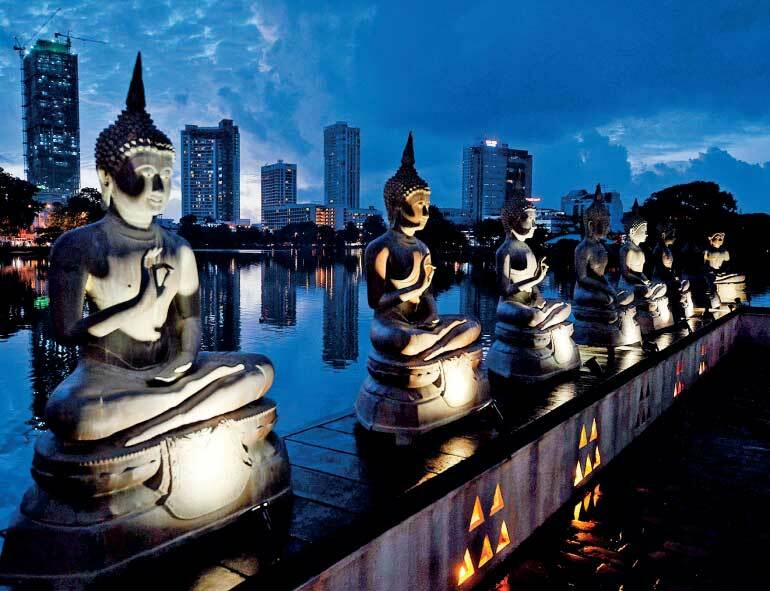 Sri Lanka’s main exports – textiles and garments – have begun to face stiff competition from new comers to the market such as Bangladesh, Myanmar and Cambodia. Hence, Sri Lanka has to move from simple technology-based economy to a complex technology-based economy. This can be done only by joining the Asian supply chain, also known as global production sharing. To join the supply chain, Sri Lanka has to closely collaborate with the two giants in the region. Hence, Sri Lanka has no choice but to adopt a development strategy that helps it to grow with giants.